Minneapolis Institute of Art gets $6 million for "Gale Asian Art Initiative." 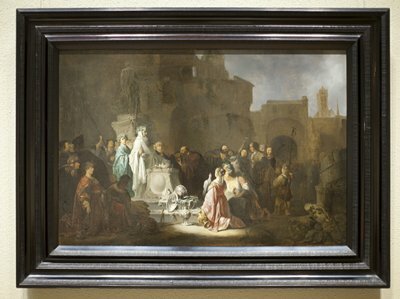 Chinese artist Liu Dan plans to create a new ink painting in response to the Willem de Poorter painting "St. Paul and St. Barnabas at Lystra," (above) in the collection of the Minneapolis Institute of Art. With a $6 million bequest from Alfred P. Gale (1927-2012), an investor and heir to the Pillsbury flour milling fortune, the Minneapolis Institute of Art will launch the Gale Asian Art Initiative, a program of exhibitions, events and workshops designed to enhance public appreciation of the museum's extensive collection of Asian art including in depth holdings of Chinese and Japanese furniture, sculpture, textiles and paintings. The program will open with "Ink Unbound: Paintings by Liu Dan," a special show of new work by Liu, one of China's leading contemporary artists who will be in residence at the museum September 17-30, 2016. The museum commissioned Liu to create a new ink painting in response to a painting of his choice in the museum's collection. He picked "St. Paul and St. Barnabas at Lystra," a 17th-century Dutch picture by Willem de Poorter. Liu's response to the de Poorter image will be unveiled September 17. Programs to be paid for with Gale funds include a "Family Day" celebration of Chinese New Year featuring dance and music and a four-part series of adult programs about Chinese art. Additional programs will include public workshops on Japanese courtly painting and tea ceremonies. Vietnamese funeral rituals and traditions will be explored in conjunction with the Propeller Group, an artist collective based in Ho Chi Minh, Vietnam. The group will curate an exhibition of Asian funerary objects drawn from the museum's collection and present it along with the ensemble's video "The Living Need Light, The Dead Need Music." Three special events will be held for member's of Twin Cities Asian communities in an endeavor to boost awareness of the museum's Asian collections. Gale funds will also support a three-month museum residency for an Asian expert whose job will be to boost community outreach and gallery interpretation of Asian art. The Institute's Asian collection features some 16,800 objects ranging from ancient pottery and bronzes to Buddhist sculpture,woodblock prints, lacquer, and contemporary ceramics.